The New Year belongs to the victors, like Gov.-elect Larry Hogan, Jr. But reality will set in quickly once hard, unappetizing choices pit campaign pledges against on-the-ground reality. During the campaign, Hogan criticized both mass transit lines as too expensive, given Maryland’s financial situation. He said the money would be better spent on roads, not rapid rail. At the same time, Hogan pounded away at the need for aggressive job and business creation. He pledged to energize the state’s lackluster economic development effort. 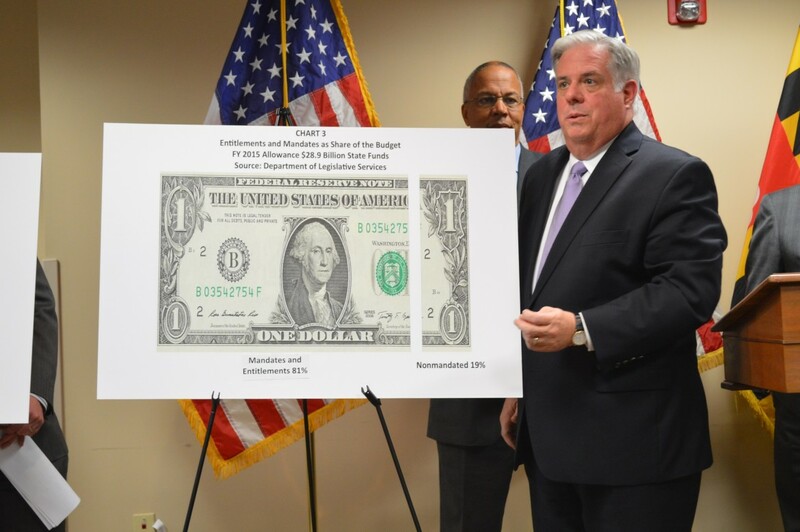 Killing the Red Line in Baltimore and the Purple Line in the Washington suburbs would, indeed, save lots of money for Maryland – $1.035 billion on the Red Line and $637 million on the Purple Line. But not a penny of the savings will help Hogan close the $1 billion general fund budget deficit staring him in the face. Even worse, the savings probably wouldn’t pay for much in the way of local highway work, either. That’s because the state would only be paying one-sixth of the cost each year as construction proceeds over a six-year period. Compounding matters, revenue estimates for transportation taxes are proving too optimistic, leaving a $441 million hole in the state’s six-year transportation plan. Killing the Red and Purple lines would close that gap, but what’s left would not have much impact on local road-building when spread over six years. The demise of Maryland’s two major transit projects would be devastating for transportation contractors and the thousands of workers who wouldn’t be employed building the two rail lines. That hurts Maryland’s jobless rate and its economic growth. So killing the two projects outright may not be the smartest step. Baltimore badly needs the Red Line to connect its inadequate transit system. The Purple Line is crucial for near-the-beltway, lower-income neighborhoods and to lessen the car crunch in rush hours on the Capital Beltway. Then, there are the political ramifications. Kill the two transit lines and the new governor immediately makes enemies of the three largest delegations in the Maryland General Assembly – Baltimore City, Montgomery and Prince George’s counties. Together, the three delegations have enough votes to make life miserable for Hogan. There’s got to be a middle-ground way, perhaps involving a construction delay while engineers hammer out cost-effective options to lower the price tag for the two rail routes. When the Woodrow Wilson Bridge crossing the Potomac River was reconstructed, the cost soared out of sight. Only after a project engineer, Tom Mohler, (now a partner with RK&K Engineers in Baltimore) devised a cheaper approach – chopping the massive project into smaller chunks – did the price tag diminish enough for Maryland, Virginia and the District to proceed with construction. That’s what may have to happen with the two expensive mass transit routes, too. Hogan faces a huge budget deficit, which may require a deep cut in school construction funding, from the $300 million level favored by the O’Malley administration to the $200 million level. The problem is that many of the counties where Hogan was wildly popular are the very counties lobbying for more new schools to handle a surge in students. Hogan might end up disappointing the very voters who put him in office. Clearly the state’s budget hole, plus the state’s over-reliance on floating bonds, calls for reductions in spending. School construction costs stick out like a sore thumb. Hogan might attempt to do more with less – by emphasizing renovations of existing schools over costly new construction. He may be able to stretch fewer dollars further. But, it won’t make all of his supporters happy, especially those with kids attending overcrowded public schools. Since 2012, this has cost Maryland taxpayers $62.5 million in tax credits to the production companies. Yet this has put hundreds of skilled laborers to work behind the scenes: designing sets, arranging the lighting, working on the sound and engineering crews, preparing the costumes and working as extras. Hundreds more have been hired locally to play roles in the TV series. If the tax credit is killed, one of the biggest losers would be Harford County, which, ironically, gave Hogan an overwhelming victory in November. The Department of Legislative Services claims the film tax credit has generated little in the way of a return on the state’s investment, but the DLS may have been looking at the wrong indicators. As an economic development tool, the tax credit may be working quite well in nurturing a local film industry where an evolving core of high-quality, skilled craftsmen and artists attract many more film crews to Maryland. Kill the film tax credit and you likely kill any chances of Maryland retaining “Veep” and “House of Cards.” Hogan would be chopping off any possibility of Maryland developing a reputation in Hollywood as a welcoming place for film production. For a governor promising to grow jobs and the state economy, Hogan might be sending the wrong signal by taking an ax to the film tax credit. Such unappetizing choices put him in a bind. Hogan must find a way to balance the state’s books while not forsaking his pledge to jump-start Maryland’s quest for jobs and business – while at the same time not alienating his supporters or powerful groups in the legislature that could potentially subvert his agenda.